I love tradition. There is something so comforting in traditions, don’t you think? Familiarity and warm memories. I love it. There are a few destinations that we, as a family, have experienced enough that we have started to look at them like traditions. Going to an all inclusive resort in the Poconos just happens to have become our favorite winter-time tradition. That resort is Woodloch Resort. 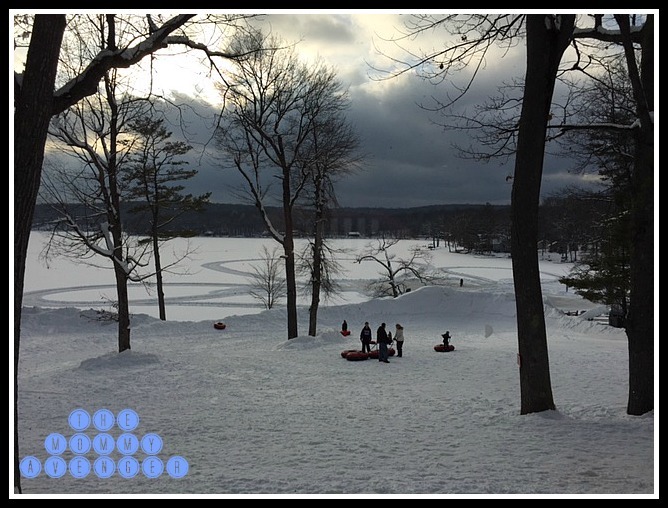 This past weekend, my family and I were invited to visit Woodloch Resort*. We desperately needed a break and this was just what the doctor ordered! The plans at Woodloch Resort are all-inclusive. Your room, food, and activities are all included in the price of your reservation. People have referred to it as a Cruise on Land. We parked our car Friday and didn’t need it again until we checked out late Sunday afternoon. We walked into our room and were instantly knew we were in for a great weekend. Our room accommodated our family of six, holding two queen sized beds, and a leather pull-out queen sized couch. The room was very spacious with two full bathrooms,living area and bedroom. One feature that I really loved, that I would not have ordinarily thought about was a walk in closet to the right of the door. This space allowed us space to hang our coats, place our snow gear (which is a lot when you have six people!) and all of our luggage without clogging up space in the room. In addition, there was another walk in closet in the bedroom. We instantly felt comfortable and welcomed and could not wait to begin our adventurous weekend! At check in Friday afternoon, a list of possible activities awaited us before dinner. We ditched our stuff in our fabulous room and then headed out to explore. We went and played basketball, bumper cars, rifle and paintball shooting, and discovered a 3 story indoor playland–all before dinner!!! We certainly had worked up an appetite, which was good, because we were served massive amounts of food–this would be happening the entire weekend–I don’t think we ever had a chance to get hungry again! At dinner, the owners and staff walked through and greeted each and every guest. I have never seen this done anywhere before, and it continued through each and every meal during our stay at Woodloch–very impressive! We had the same waitress through all of our meals and the service we received was spectacular. Dinner time was always really fun and an array of specialty drinks were available for both adults and children. The kids were able to get Shirley Temples, alien slushees, and other fun drinks all topped with glowing wands, glow sticks and bracelets to be worn throughout your stay. After dinner, we decided to head over to the Splash area and the newly renovated pools. Beautiful swimming area, large pool, 2 hot tubs, a toddler wading pool, and then the splash area–lots of foam like structures in the water with sprinklers and water guns, boats, mountain slides,etc. It was amazing! To top it off, the water was warm–really warm–it felt like bath water! It was so much fun and very relaxing. After we swam, we headed back to the main North Lodge and enjoyed a fun dance party with a DJ and games. My kids ended up winning tons of fun games and prizes and it was a blast! We went to sleep exhausted, but excited to find out what was in store for us for Saturday. At breakfast the next morning, awaiting us was the daily itinerary. We could choose from Family Olympics, Cash Cab trivia, bingo, arts and crafts, scavenger hunts, ice skating, swimming, go carts, snowmobiling, extreme snow tubing, basketball contests, trap shooting, as well as all the other standard things–the Wii room, video arcades, hiking, playroom, shooting, movies, etc. The choices were virtually endless and all were things you could enjoy with everyone in your family. The only interruption was lunch, and then back to more activities! We filled the day with so much. We competed as a family in a huge movie trivia game, as well as Name That Tune. These games are my favorites and can get really competitive! I pretty much rock at those types of games (the only type of games I do well in, actually) I have to admit, but I was certainly challenged by the knowledge of other teams. It’s fun to join together with other guests and get to know each other by playing these fun games. Each game is so well organized and run by the social entertainment staff. It’s such a pleasure to take part in these activities. My younger boys were able to participate in the Archery Dodgeball competition and walked out with gold medals, triumphant in their newfound skills in a game they didn’t know how to play before we arrived. Creativity is abundant at Woodloch and you will find yourself playing and participating in activities you wouldn’t have imagined before getting there. As if there weren’t enough entertainment, Woodloch offers a special program Saturday night. We were requested to dress up for dinner, and the atmosphere was charged with excitement from the theme of the evening–“ A Night at the Musicals”. A fancy dinner and dessert freckled with familiar characters such as Spider-Man, pink ladies, Aladdin and a ton of others. The kids were excited and amped up even more. Following dinner, you could go see a special production,a Broadway-style musical, followed by a comedy act. Babysitting was available for those that needed it, and if you were too tired from the day’s activities, you could even watch the show from your hotel room. We actually opted to eat dinner and run out for tubing under the lights and a soak in the hot tub before going back for the show. It was a great way to relax between the meal and the show. All the while, most of the other activities were still going, as well as a special night run of extreme snow tubing! If you wanted to, you could keep busy until 11pm! There was just so much fun to be had! We arrived in the nightclub of the resort ready to take in what was planned when we were done. Oh, my gosh, you guys. You know I see a ton of Broadway shows. I live just outside New York City and theatre is something I am confident in telling you I know quite a bit about. I’ll be honest, I didn’t expect much of a production. Maybe a corny talent-show, sing-along, or something. Definitely, I expected family-friendly and fun, but what I found was shocking. It was a full blown production with all the greatest Broadway hits from all time. Sets, professional singers, you name it, they had it. And it was GOOD! Turns out, Woodloch hires professional actors and singers straight from Broadway to come and participate in the show, peppered with some surprisingly amazing talent from Woodloch’s social entertainment staff. It was unreal. So entertaining and well done, I couldn’t believe it. Bravo, Woodloch, bravo! We were treated to Hamilton, Hairspray, On Your Feet, Beautiful and a huge array of other favorites throughout the show. I could not get enough. Immediately after the production, we were treated to a very funny comedian that could be enjoyed by every family member. It was a great night of entertainment. The next morning was breakfast and a new itinerary for the day. This would be check out day–which, by the way, isn’t until 2pm! They really encourage you to stay and enjoy as much as you can, so we did! My older boys entered the extreme snow tubing contest and had a blast. They came out of the contest with a gold and silver metal. While they were doing that, my younger two were off exploring and enjoying different activities. We filled the morning with more hiking, tubing, bumper cars, Woodloch Forest (because you can never get enough of the 3 story playland), and lots and lots of laughing. Our last meal of our stay was the SMORGASBORD. I didn’t know what that would be, but when we showed up to the dining room, it really was an incredible sight. A carving station, tables of salads, sandwich meat, breads, cheeses, mound and mounds of fruit, jumbo shrimp, Alaskan King crab legs, chicken tenders (a standard for the kids), pizza, the list goes on and on! All meals are unlimited refills, and they make sure you don’t leave hungry! Many people I spoke with at the resort had been coming back for ten or more years. Some had been going there since they were kids. It had become a tradition in their family and one that they wanted to pass on to their own kids. I can see why. The staff at Woodloch Pines are exceptional. Their happiness and enthusiasm are contagious and they make sure that this place is to be all about the family–everything offered at Woodloch is meant to be enjoyed by every member of the family. The staff treats everyone the way they would like to be treated–and it shows. The entire weekend, I didn’t see one frowning face–everyone was all smiles. Different families interacting with each other as if they had always known each other. Eventually, we knew it was time to leave, which was hard. We all had such a great time, and as many vacations as we have been on, this one was different. There was a different feeling here–it was as if the outside world didn’t exist. Nothing else mattered, except truly enjoying your family and reconnecting with one another. This was a vacation all about making lasting memories with your family. I can’t rave about this place enough!! Go experience it for yourselves, you will be glad you did. Friday through Sunday was enough of break for me to feel like I had been on vacation for a month. I came back recharged and energized and even more thankful for my wonderful family. So glad that we took the opportunity to go and spend time with each other at Woodloch Pines. You can book your own vacation at www.woodloch.com. Rates vary, but you can go any time of year, activities change by the season. I, for one, can’t wait to go back in the summertime! *we were guests of Woodloch Pines to facilitate a review, all opinions are my own.